The long conflict between the Acehnese independence movement (GAM) and the Indonesian army (TNI) has been solved for the time being by the peace agreement on 15 August 2005. The peace process has been quite smooth since. In 2006 the province held its first direct and democratic local elections. In 2007 the first democratically elected Governor, Irwandi Yusuf, was inaugurated. Foreigners no longer require a travel permit (Surat Jalan) to enter Aceh, but an Indonesian visa is required. It is possible to get a 30-day Visa-on-Arrival at Banda Aceh Airport. The embassy in Kuala Lumpur can sometimes process the visa in the same day if you complete all the paperwork before noon, though this is supposed to apply only to Malaysian residents. There are non-stop night buses, with travel times ranging from 9–13 hours - from Medan to Banda Aceh. Major bus companies such as PMTOH, Pelangi, Kurnia and Pusaka have offices on Jl. Gajah Mada, Medan. Price ranges from Rp 110,000 in a regular-sized-seat bus to Rp 200,000 in a wide-seat bus. 5.52333395.4202781 Sultan Iskandar Muda Airport (BTJ IATA). Named after the 12th sultan of Aceh, Iskandar Muda. Lion Air, Jakarta-Soekarno-Hatta, Medan. They have two daily flights from Jakarta and one from Medan. To go to the airport, you can catch the bus at 08:00, 14:00 or 15:00 in front of the Big Mosque. The main methods of getting around are becak (motorbike taxis) and labi-labi (public minibus). Due to the sudden influx of money post-tsunami, locals have gotten used to overcharging, but now stabilisation has returned. Example becak fares are: Airport - Grand Mosque: Rp 40,000; Bus Terminal - Grand Mosque: Rp 8,000; Grand Mosque - Penayong: Rp 5,000. Inside the city, generally Rp 10,000 should do it. Cut Nya Dien House. Cut Nya Dien was an Indonesian woman revolutionist from Aceh. The house is a replica of the heroine Cut Nyak Dhien House, from the Aceh War. The colonial forces burned down the house but a replica was built later. This house in Lam Pisang, about 6 km from Banda Aceh and is now is a museum. The house is in Lampisang Village, Lhok Nga subdistrict, Greater Aceh district. Although Lhok Nga was the area worst hit by tsunami, the Tjut Nyak Dhien House survived. The daughter of a chieftain, Tjut Nyak Dhien joined the fight against the Dutch invaders in 1875. Her first husband fell in battle, and she remarried. When her second husband also died fighting, she continued the struggle with her children. After six years in the jungle, she was captured by the Dutch and exiled to West Java where she passed away in 1906. Tjut Nyak Dhien is recognised as one of the National Warriors of Indonesia. Gunongan and Taman Putroe Phang. Gunongan had erected by Sultan Iskandar Muda (1607-1636) as a private playground and bathing place for this wife Putro Phang (From Malaysia). This whimsical architectural fantasy had access to the sultan's palace through the traditional 'Pintu Aceh', used by royalty only. This building likely functioned as an important recreational peace located in the Taman Sari Park for the Queen and other royal family members to climb. It is quite enjoyable to visit this place during the late afternoon or sunset. Graveyard in Bitay Village. In Bitay the grave of a saint, Teungku di Bitay, may still be seen. The tomb of Tuan di Bitay, who taught the Achehnese among other things the art of casting cannon, and the mosque which stands beside the grave are revered as sacred up to the present day. Aceh and Turkey had a close relationship in times past. Many technicians and weapons from the Turkish fleet came and settled in Aceh. Historical remains of this time include a mosque and a monument and headstone Turkish people in the village Bitai (~ 3 km from Banda Aceh). The Museum Aceh, Sultan Alaidin Mahmud Syah St.. The museum exhibits ceramics, weapons and many cultural artifacts such as clothing, jewellery, calligraphy, Islamic ornamenation, kitchen equipment and many other items. A most interesting item is a big bell called “Lonceng Cakra Donya”, a gift from China Grand-Duke (Ming Emperor, in the 15th century) for Sultan Aceh that was delivered by a Chinese Moslem, Admiral Cheng Ho in 1414, an inscription on the bell reads; “Sing Fang Niat Toeng Juut Kat”. In this complex there is also ‘Rumah Aceh’ house that was built by Dutch Governor Van Swart in 1941 in a style typical of classic Aceh’s house architecture. To the west of the museum or north of Aceh House of Custom there is graveyard complex holding the remains of Aceh Sultans. Indonesian Airline Monument (Seulawah-Indonesian First Airplane). The monument was erected to commemorate the heroic contribution of the Acehnese to the emergence of the Republic of Indonesia. When Indonesia became independent in 1945 the Dutch intended to reoccupy the country. In the ensuing struggle in 1949 much area had fallen to the Dutch, the Republic of Indonesia was badly in need of an airplane to avoid the blockade of the enemy. Soekarno, Indonesian president at that time, urgently asked the Acehnese to donate money for an airplane. A Douglas DC-3 was purchased shortly afterwards, and paid for with the donation. This very early plane was the precursor of Garuda Indonesia fleet. Kerkhof (Dutch military graveyards of Banda Aceh), Teuku Umar St (the entrance gate is in front of the south eastern corner of Blang Padang). Kerkhoff or War Memorial Cemetery or known by local peoples as Peucut Kerkhoff, 2,000 Dutch soldiers who died in an Aceh War were buried in this graveyards. On the walls of the Kerkhoff entrance gate you may see the names list of the persons buried including details of where and when they died. Ulee Lheue-Banda Aceh (Tsunami Ground Zero). Ulee Lheue is a shore line facing the Malacca straits; when the tsunami hit Banda Aceh on 26 December 2004, the beach line and the village nearby were severely damaged and submerged by a 10 m high wave. Now the local government has built a new seaport at Ulee Lheue, and if you have plans to visit Sabang and Weh island, you can take a Ro-Ro ferry or speed boat from Ulee Lheue. Ulee Lheue beach has still kept its enchanting beauty, and almost every day people come to this place to enjoy the blue horizon of sky and sea, to see a beautiful sunset in the evening, or to enjoy the beach at night on the weekend. Aceh Culture & Tourism Agency, Jl. Tgk. Chik Kuta Karang No. 3 (There are two eateries in number 3-5. The tourism agency is inside the government building right across the street of these eateries.). Very friendly and helpful staff. They provide (free): a map of Banda Aceh and the region around Banda Aceh, a map of the Aceh-province, a very nice Aceh Guide Book (colorprint). These items are put in a small, really beautiful, shopping bag with pictures of Aceh on it. Fisherman boat on an inhabitant house, Desa Lampulo, Kota Alam. 59 people were reportedly saved by boarding this small boat and riding it to safety. Very dramatic image indeed. free. Floating Electric Generator Ship, Kampung Bunge Blangcut, Jayabaru. A ship was carried 5 km inland during the tsunami. You can get a nice overview of the city from the top of the ship. Tsunami Monument & Garden. Located beside the electric generator ship. Apung 1 ship, a 2,600-ton vessel that was swept 2 km inland. Now it is a tourist attraction. Mountain Biking Cycling Hiking, Jl Al Huda Blok B, No 2 (close to food court). Cycle around the mountains, rice fields and beaches near Banda Aceh. Hike and bike tours and mountain bikes available from Rp 50,000. Banda Aceh city highlights tour on a Bicycle., Jln Al Huda Blok B, No 2 (close to food court). A bike is a great way to explore both the long history of Banda Aceh as well as the impact of the 2004 Tsunami. Bicycles, maps and route descriptions are available at Aceh Adventure. Tour around on a Motorbike (A motorbike is an easy and adventurous way of exploring Aceh), Jl Mesjid Al Huda Blok B No 2 (close to food court), ☎ +62 813 99578873. 24 hr. After the tsunami international donors and the Indonesian Government build plenty of excellent roads. The road along the west coast is of great beauty. Expect green hills and mountains and behind every corner an even more beautiful beach. Rp 100,000. Island dropping, Jl Mesjid Al Huda Blok B no 2, ☎ +62 813 99578873. 09:00-17:00. The uninhabited island of Pulau Kreusik has a splendid, mosquito free white beach and is about 1 hour from Banda Aceh. The island has safe swimming. You can either make a day trip to the island or stay overnight. around Rp 800,000 (round-trip). Discover Aceh Divers Club, Jl Utama No. 1 Lamjamee, ☎ +62 812 6970 1430. There are some nice diving spots around Banda Aceh such as Pulau Tuan, Pulau Bunta and Lhok Mata Ie with underwater fish and corals. If you are lucky you will see Manta rays. The price includes the boat from Banda Aceh. Certified divemasters will accompany you when diving. €25 per pax per dive, minimum 4 pax. There are approximately 65 NGOs operating in Banda Aceh; however, they generally do not recruit non-Indonesians locally. These NGOs include various UN and EU agencies, USNS, Care, Americare, Islamic Relief, International Federation Of Red Cross and Red Crescent, Australian Red Cross, Turkish Red Crescent, Kuwaiti Red Crescent, French Red Cross, IMC, IOM, WHO, Japan International Cooperation System, Habitat, Medecins sans frontières, Japan Platform, USAID. AT the peak of the post-Tsunami aid effort there were 850 NGOs, but many of these were non-Muslim religious organisations and their permits were not extended by the Indonesian government. There are interesting fish, meat and vegetable markets in the centre of town. There are also some small souvenir shops selling various local items. The recently opened Hermes Palace mall is located at the city centre of Banda Aceh. The mall has over 100 stores with foodcourt, supermarket and clothing stores. The Acehnese breakfast staple is nasi gurih, rice cooked in coconut milk, sold in coffee shops everywhere. Food stalls and Padang restaurants are open across the undamaged part of town, and fruit carts are ubiquitous. [dead link] Canai Mamak KL Restaurant, Jl Teuku Umar No 51, Seutui. Malay Food, Halal Toyibah. PaceBene (Bene Restaurant), Jl Bhakti no 33A-B, Kampung Laksana, ☎ +62 651 31035. Best restaurant in town, not just for its fresh seafood, pasta and pizza, but also its great roof top garden. Dishes work from an Italian template, but with the best ingredients Banda Aceh has to offer. And watch out for when the salsa comes on, for the wait staff burst into spontaneous song. Also open weekdays for lunch. Istana, Jl. T. Panglima Polem, No. 66-68, ☎ +62 651 31287. Two locations. Offers your typical Aceh fare in an A/C dining area. Careful ordering - they may serve and charge you two dishes. Hermes Palace (formerly Swiss-Belhotel). The restaurant here presumably offers the best hotel food in town and has nice dinner buffets as well as a la carte. There are some nice coffee houses with soothing rice paddie views around Ulee Kareng, along Jl Tengku Iskander on the town’s western outskirts. Drinking alcohol is not allowed. Coffee-drinking is the main activity. My Juice, Jl. Twk M. Daud Syan, No. 9-11, ☎ +62 65121613. On what you might call "Auto Blvd", this clean, friendly restaurant features some of the best juice combos around. Try the terung belanda fruit juice, which is only indigenous to Sumatra. Friends caffee, Jalan Kartini (from Hotel Medan, turn left, the first right, then first left, and walk into the Jl Kartini untul you see Friends caffee on your left hand site). from noon. Excellent expressos, latte, iced-lattes and great juices. Glee Cafe & Resto, Mataie Hillside Adventure & Water Park (Mataie - Keude bieng). Black and White rumoh kuphi, Jl. T. Umar No. 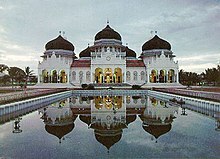 19 Banda Aceh. A cozy place to hang out with friends. You can find friendly faces although if you come solo. Coffee, local food including mie Aceh and various fresh juices. Free wifi is available. Hotel Lading, Jl Cut Meutia 19, Banda Aceh (next to Bank BRI), ☎ +62 651 635123. Check-in: 14:00, check-out: 13:00. A 5-min walk to the Baiturrahman Grand Mosque and Pasar Aceh market. With a nice view of the Aceh River. Close to several banks, restaurants, supermarket and internet cafe. Airport shuttle services also available. US $15-30. Hermes Palace Hotel (formerly known as the Swiss), Jl. T.Panglima Nyak Makam, ☎ +62 651 755 5888. IDD telephone, refrigerator, hair dryer, internet access and 32-channel TV, wake up call service, concierge, meeting room, business centre and 24-hr room service. From US $70. Hotel Sultan (in the centre). 2 star hotel, around US $30–40. Pavilliun Seulawah, Jl. Prof. A. Majid. Ibrahim II No. 3, (in the centre,). Good hotel with a restaurant, WiFi is included. Next to a park with sports possibilities. Around US $50. Oasis Hotel (just outside the centre). More cozy than the Swiss Bell and the rooms are just as nice, with WiFi in the lobby. Around US $75 per night. Uncle's Homestay, Jl Mujahidin No. 2A, Lambaro Skep. ☎+62 852 6028 4432 (mobile phone) or homestay ☎+62 821 6821 5200 or ☎+62 852 0673 5330. This place is not the same since "Uncle" (Abdul) passed away. Now his widow Yulia runs the place. A bit far away from city center, offers basic rooms (water in the toilet after request) Rp 90,000. The Pade Hotel, Jl Soekarno Hatta 1, ☎ +62 651 499999. Check-in: 12 :00, check-out: 12:00. Boutique hotel in the town, Spacious and modern rooms, individual terrace, WiFi. Saturday night BBQ, Wednesday pasta party US $50-120. Hotel Wisata, Jl. Jend. A. Yani 19-21 (in the centre, next to Hotel Medan and Hotel Prapat). Clean basic rooms with fan, cold shower and Wi-Fi for Rp. 125.000. A room with A/C costs more (Rp. 175.000?). Hot water also possible (costs more). Night food stalls are right in front of the hotel. As with all travelling common sense and a good attitude is all you need to get along in this small city. However there are some points to keep in mind. Although Banda Aceh is nowadays safer than most European cities it is still best to not go out alone after 22:00. Because Sharia law is enforced, drinking alcohol is not permitted, although it is still possible. Infractions upon the locally perceived interpretations of Sharia law may result in arrest by the Sharia police with physical punishment and public ridicule imposed upon an offending Muslim. Muslim women should normally wear headscarves in public areas. Western-style swimsuits are not advisable except in Sabang. Pick-pocket activity is rare but do be aware and observant in crowded places. Pulau Weh is a neighbouring island, with the city of Sabang and some of Indonesia's finest diving. This city travel guide to Banda Aceh is a usable article. It has information on how to get there and on restaurants and hotels. An adventurous person could use this article, but please feel free to improve it by editing the page.